The MESA 4I38 is a general purpose programmable I/O card for the PC/104 bus. The 4I38 uses a 1M or 1.5M gate Xilinx Spartan 3 FPGA for all logic, so it is truly an Anything I/O card. 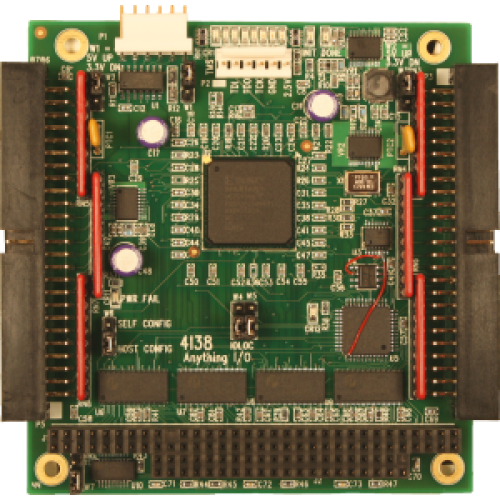 The FPGA can be configured from the PC/104 side or can be configured automatically at power up via the on card serial flash EEPROM. 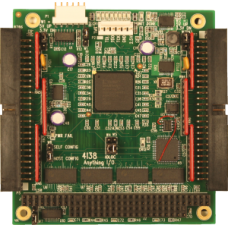 All PC/104 lines are connected to the FPGA, allowing the 4I38 to be used a a PC/104 bus master or for testing PC/104 cards. 48 I/O lines are provided via two 50 pin connectors with I/O module rack compatible pinouts and interleaved grounds. A full Duplex RS-422 port is also provided for remote communication.